Well finally into double figures and quite fitting that my 10th marathon this year should start at 10:10 on 10.10.10. However, despite all the associated good luck with the dates & times this was a tough old course and probably on a par with the one I did in Newfoundland in terms of hills. Like with many of the races I entered this year, I just blindly registered without really looking into what I was letting myself in for. A couple of weeks prior to the race I read the information and it was described as “multi terrain being around 70% on tracks and paths” – they forgot to mention the fact that you start at the bottom of an old quarry and climb your way out! I knew I was going to struggle when I was about two-thirds up one of the climbs and my ears popped from the altitude… Thankfully though, there were as many downhill sections as there were ups, though these were a bit hairy in places too! The course was quite narrow in places too, forcing everyone into single-file and the surface was quite punishing on the ankles and I am feeling the effects of that today. The weather was extremely pleasant on the day too, quite a few had commented on the driving rain they had last year so I was glad to see that history was not repeating itself. Unfortunately for me, the Berlin marathon 2 weeks ago and a heavy cold last weekend had taken their toll and I was finding the course very hard after only a few miles. This was the first time I’d actually considered retiring at the halfway point as we passed through the start area again for the second loop of the course. The cutoff was 3 hours at this point and I’d managed to get round the first 13 miles in just over 2 hours so I was comfortably within that and thought I might as well just plod on. I’d pretty much had it by 15 miles though and was struggling to put one foot in front of the other for a while. I spent most of the remainder of the race in a jog-walk pattern in which I repeatedly overtook and got overtaken by the same 7 or 8 people until we approached the last couple of miles when I started to pick it up again and managed to keep going. The last mile was all downhill back to the Eden Project site which is in the old quarry basin so at least I could let gravity do most of the work. Organisationally, I thought this went very well. Apart from a bit of a rush at the start as there was a long queue to get into the car park and there was quite a walk between the bag drop areas and the start line. The marathon and half marathon starts were staggered and the half runners only did the second loop of the marathon so there was no danger of the course getting too crowded by the faster half runners catching up. The finish area was very well laid out and the free “pasty & a pint” voucher in the goody bag was very welcome. 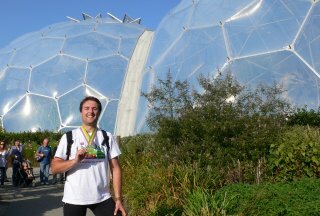 Whilst I may not do this particular race again I would love to come back to the Eden Project for a proper look around as the fairly quick tour I did after the race did not do it justice. Not been brilliant this last few days, seems that running 26 miles in the rain with 40,000 strangers is an easy way to catch a cold! Been completely drained since Friday so no long run at the weekend and still not feeling 100%. I’m going out for a few miles tonight regardless as I’ve goto marathon number 10 on Sunday so I at least need to keep the legs ticking over. Might be a bit of a jog-walk on Sunday but we’ll see how it goes. At least I’ve got a few weeks to prep for the one after!! Ok this is a bit off topic but when I’m not running I like to keep myself up to date in all things IT and recently discovered a secure Virtual Private Network, or VPN, service provider which may be of interest to anyone who is worried about privacy online or gets frustrated by those “sorry this is only available to users in the United States” messages when you try to watch one of their equivalents of BBC iPlayer to catch up on stuff you’ve missed. A VPN basically lets you “tunnel” through the internet to another part of the world and appear online at another location anonymously as if you were physically there – thus concealing where you really are and allowing you to use services that might be blocked or restricted by your internet provider locally. The folks at Super VPN Service provide a range of secure VPN services starting at $8 a month with up to 50% discounts for paying up front. So, if you’ve been worried about the recent major lapses in data protection in the news then this could be your answer. 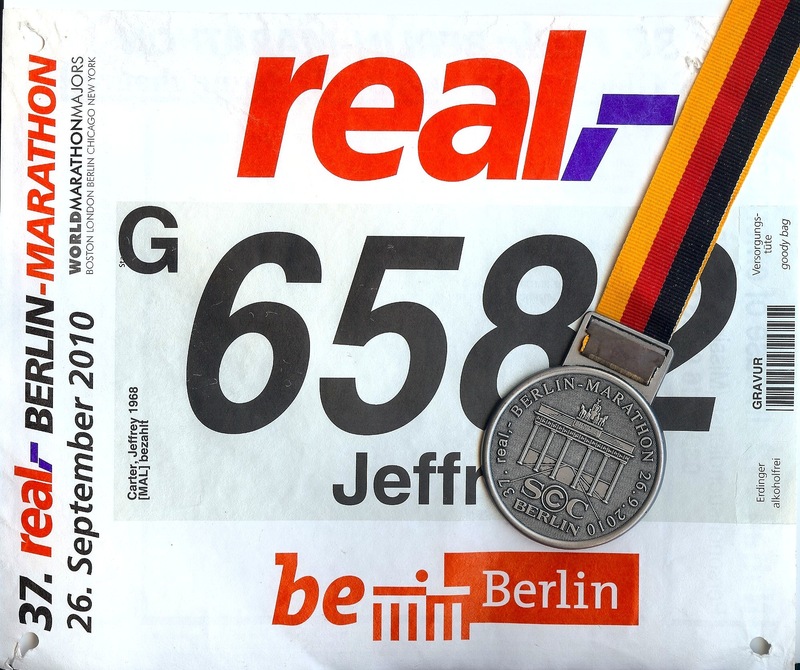 Well despite all the apprehensive buildup the Berlin Marathon was absolutely amazing. My training since the last race hadn’t really gone to plan but from the moment the gun went off I knew it was going to be a good run. Despite it being a very wet weekend the temperature was fine and the light rain throughout the run meant I could miss the occasional water station as I got carried along with the flow of runners. The crowd support was fantastic and I don’t think there was a single part of the whole 26.2 mile route that didn’t have spectators cheering or live bands playing! The organisation was first rate too – the start and finish of the race are coincidental making the whole process of dropping off and picking up your stuff very easy. 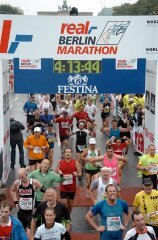 As for the finish line, you can’t get a more spectacular sight than the Brandenburg Gate as you turn the final corner at 41km and the last km is laid out in a straight line in front of you with the grandstand crowds either side as you watch yourself crossing the line on the giant video screens. I crossed the line in 4h 01m which, while not a PB, was considerably better than I expected and has certainly boosted my confidence for the remaining marathons I have yet to do this year. That makes it nine so far but number ten is only two weeks away now so I can’t afford to rest for too long! The second problem came from laterooms.com with whom I booked my hotel. I duly arrived with my printed confirmation and was told by the hotel that they had no such booking and were full – just what you need when you’ve arrived in a strange city on one of the busiest weekends of the year!! Anyway, the hotel (a small family run one) were very helpful and sorted me out with another hotel at the last minute which turned out to be a bit closer to the start line so not a total disaster. So, thanks for nothing laterooms.com and for anyone thinking of using them I suggest you double check with the hotel after your “confirmation”. Only 4 months and 4 more races to go! The Berlin Marathon is this Sunday and I’m just starting to get my head around it. The pressures of work have had a real impact on my training this month so I’m not nearly as prepared as I should be but I’m hoping the atmosphere and the crowds will give me that all-important boost to get me round the route. All those weeks ago when I finished the Baccalieu Trail in Newfoundland I was thinking how great it was going to be to get a good 6 weeks of prep in for this one – yeah right! Oh well, there’s always next year for a new PB! I’ve seen quite a few Facebook and Twitter posts from others who will be running in Berlin this weekend as well so good luck to everyone and see you at the finish! Well at the risk of speaking too soon I think I’ve finally turned the corner this week as I’ve got a couple of good runs under my belt and felt much more energised out on the road. It might be the fact that the cooler nights are taking me back to my earlier training when I was leading up to marathon number 1 in Jan as I had quite a good routine at that time. Holidays, work and hot weather just threw everything out of sync so I’m really glad to be feeling like things are getting back to normal. Anyways, the acid test will be tomorrow’s long run but since I’ve only got just over a week to the Berlin Marathon now I’ll not be going too mad. Thanks to all for the messages of support last week, it really helped with getting my head back in the game.